MOOD instantly personalizes everything you want to say. With MOOD you style your texts as you write them, with a huge number of filters, fonts, illustrations, backgrounds making them creative and original. Your words now have even more power! Download MOOD now, the acclaimed app for design and text lovers and personalize your slogans, quotes, mottos with more than 100 filters, backgrounds and colors. From now on, it’s not just what you say, but how you say it. 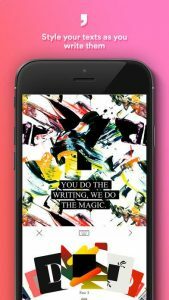 Express yourself in a graphic and impactful way with App Store’s most original writing tool. Did anyone say that writing is boring? MOOD works with every app and/or social network that allows you to post/send an image.